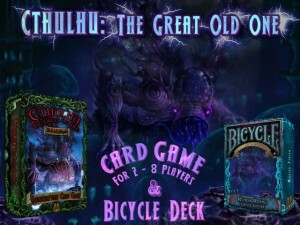 Dan Kriss Games has re-launched their Cthulhu: The Great Old One card game and Bicycle Card deck Kickstarter campaign. Check out this new and improved campaign. CTHULHU: THE GREAT OLD ONE is a Lovecraft-themed quick-paced card game by Dann Kriss Games, a loving tribute to the works and legacy of H.P. Lovecraft, with hand-painted artwork by Ian Daniels. Each deck contains 80 masterfully-crafted cards printed on high-quality gaming cardstock (black-core), to reverently evoke the themes of the Mythos into this soon-to-be-classic card game. With fun elements like Horror cards you can play on each other while matching up characters and elements from the works of Lovecraft, there are lots of fun games in store for you and your friends, family, and fellow cultists. We at Dann Kriss Games hope you will treasure your decks for years to come, which is why we have painstakingly endeavoured to craft each deck with the highest available quality and durability, approaching each card layout with lovingly meticulous attention to detail, helping to bring each card to life with some of the most amazing Lovecraftian images we have ever seen.